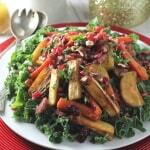 You are here: Home / Christmas Recipes / Fun Christmas Food For Kids! 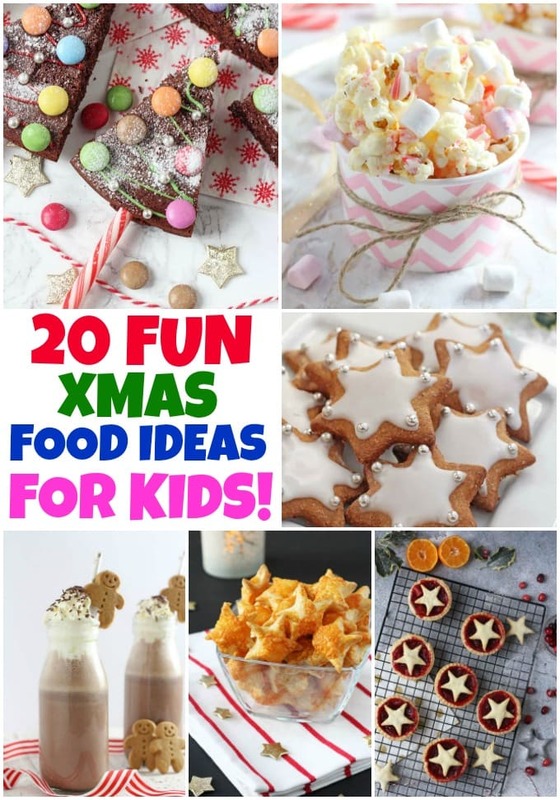 20 Fun Food Ideas To Make With The Kids This Christmas! The festive season is a brilliant time to get kids in the kitchen showing them that food can be fun and colourful. Whether it be for their lunchbox, just baking for fun, making something for the school Christmas Bake Sale or even making food gifts for their friends, your kids are going to love our selection of Fun Christmas Food For Kids! 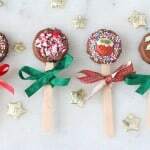 Have some fun with festive baking and make these Christmas Tree Chocolate Cake Pops. They are really easy to make and the kids will absolutely love decorating them! A great way to get into the kitchen with your children this Christmas! This Candy Cane Popcorn with White Chocolate and Marshmallows makes a tasty festive treat and can be packaged up as an edible gift too! Delicious individual shortcrust pastry pies packed with cranberry, orange and apple. Perfect for Christmas and a great alternative to mince pies! These Chocolate Rudolph Cookies are made from a Gingerbread Man cutter. When the cookie is turned upside down and decorated it makes a perfect reindeer! 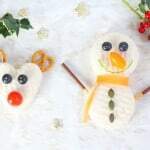 Kids will love getting creative and making these Christmas themed Rudolph and Snowman sandwiches! 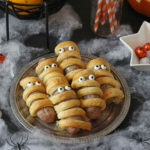 If you love a treat, then you’re going to want to make these!! These Christmas layered jelly pots are super simple to make and super yummy to eat. A super easy festive Rocky Road recipe made with white chocolate, cranberries and shortbread. A delicious decadent dessert that’s perfect for Christmas! This fun recipe is perfect for Christmas party food, lunch boxes or just a fun and healthy festive snack for kids. Satsumas dipped in dark chocolate and coconut oil and sprinkled with desiccated coconut. A healthy, low sugar snack perfect for the festive season! A really cute and healthy idea for the Festive Season! A healthier version of these delicious Christmas Gingerbread Star Cookies made with wholemeal spelt flour, coconut sugar and maple syrup. These Christmas Pudding Cupcakes are the Christmas baking project for the person who is just not a baker! A Pear Rudolph is a quick, healthy and fun Christmas snack! WARNING: Date and Nut Mini Christmas Puddings are highly addictive. Try not to eat all the mixture before actually making the puddings! These Cheesy Puff Pastry Stars make a super easy appetizer for Christmas parties and a great festive snack for kids too! A fun and healthy Christmas themed snack that the kids will love making and eating! We usually think of Christmas fudge as being quite processed and full of sugar, but it is possible to make a very healthy alternative using just two simple ingredients! A beautifully bright and fun Christmas themed smoothie!